Michèle Mercier, Robert Hossein, Guido Lollobrigida et al. DVD: 90 min., Blu-ray: 90 min. After her husband is lynched by bandits, Michele Mercier (Mario Bava's Black Sabbath) seeks revenge and turns to an old friend, played by Hossein, for help. A solitary figure who lives in a ghost town and dons a single black glove before each gunfight, Hossein is initially reluctant but soon infiltrates the widow's enemies to force a showdown. 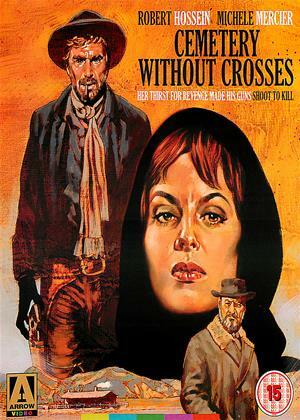 'Cemetery Without Crosses' is a darker breed of Western, bleak and melancholy in tone amid the explosive set pieces. It also boasts an outstanding score by composer Andre Hossein (father of Robert) and the catchiest of themes, sung by cult figure Scott Walker.